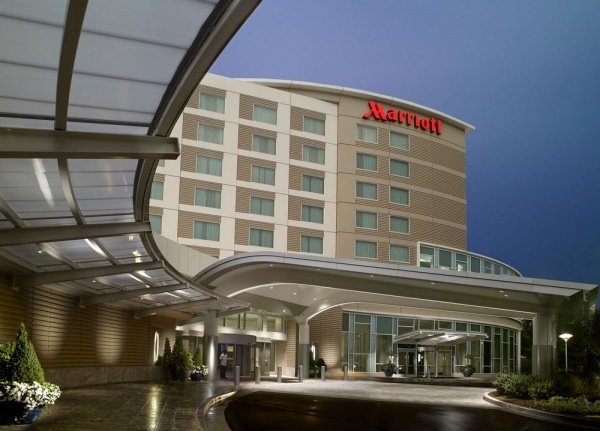 Renaissance Hotels, part of Marriott International, Inc. announced the grand opening of Renaissance Atlanta Airport Gateway Hotel. Boasting two expansive outdoor spaces, an amenity-driven fitness center, and a buzzy bar, the hotel is conveniently connected via SkyTrain to the Hartsfield–Jackson Atlanta International Airport. Most Atlantans never have a need to take the SkyTrain, which goes to the Georgia International Convention Center and Gateway hotels, as well as to the airport rental car center. But it’s a convenient form of transit for those who don’t want to depend on hotel shuttles, rental cars or other transportation to get from the airport to their hotel or the convention center and back. The property features stunning artwork by Atlanta natives: Ryan Coleman, Matt Herbermehl and Sarah Emerson, which entice travelers to look and look again at every turn. From the whimsical porch swing to the digital art projections and larger-than-life mural depicting an abstract world map located in the lobby, the hotel creates a sense of arrival before guests check in. With 11 original murals found throughout the hotel, the ambiance is inviting and relaxing, yet spirited and youthful. A twist on the traditional business center, the hotel adds a hint of humor to the flexible collaboration space with an assortment of seating and drawers that encourage guests to write notes about their travels for other guests to read along their journeys. Renaissance Atlanta Airport Gateway Hotel features 204 stylish and sophisticated guest rooms, including eight suites, which thoughtfully balance residential Southern charm with a modern design aesthetic and pops of the unexpected – to which there is no better example than the custom murals found in each of the hotel’s eight suites, created by artist Ryan Coleman whose gritty graffiti style juxtaposes a polished, animated element inspired by his father – a famed animator for Disney. Led by Specialty Chef Blake McDonald, Hickory & Hazel Southern Table and Bar brings the local flavor from New Orleans to Atlanta and is the epitome of southern hospitality. From fried green tomato eggs Benedict and shrimp and grits to a 13th Colony BBQ Brisket Sandwich, guests can indulge in southern comfort with an edge. Also gracing the menu is an old south classic house-made moon pie served with RC Cola. Hickory & Hazel features rustic tables and a dramatic horseshoe shaped bar serving signature cocktails like the Suits your Fancy made from Pisco, pamplemousse rose, fresh celery seed and fennel syrup, fresh squeezed lime juice, and egg white. Meeting planners should know the hotel offers 6,290 square feet of total event space. Cleverly named after the radiotelephonic spelling alphabet, commonly used in Aviation communication, the Alpha, Bravo, Foxtrot and Echo meeting rooms alongside the Tango Ballroom make up seven total event rooms. A 3,345 square-foot ballroom is perfect for large celebrations and features a floor-to-ceiling outlook of the Tango Terrace. The non-traditional layout is equipped with lounge-style furnishings and decor that pull in natural elements, neutral tones and wall coverings with a custom mural inspired by the flora and fauna of Atlanta. To read more at Travel Daily News, click here.